Black bear walking in a grassy meadow. 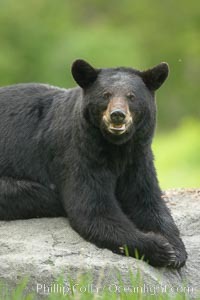 Black bears can live 25 years or more, and range in color from deepest black to chocolate and cinnamon brown. Adult males typically weigh up to 600 pounds. Adult females weight up to 400 pounds and reach sexual maturity at 3 or 4 years of age. Adults stand about 3' tall at the shoulder. Minnesota Photo. Black bear walking in a grassy meadow. 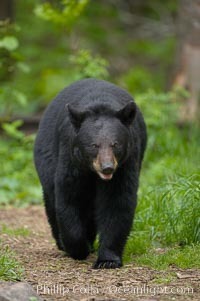 Black bears can live 25 years or more, and range in color from deepest black to chocolate and cinnamon brown. Adult males typically weigh up to 600 pounds. Adult females weight up to 400 pounds and reach sexual maturity at 3 or 4 years of age. Adults stand about 3' tall at the shoulder. Minnesota Picture. Black bear walking in a grassy meadow. 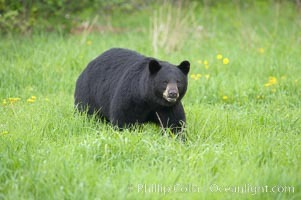 Black bears can live 25 years or more, and range in color from deepest black to chocolate and cinnamon brown. Adult males typically weigh up to 600 pounds. Adult females weight up to 400 pounds and reach sexual maturity at 3 or 4 years of age. Adults stand about 3' tall at the shoulder. Stock Photography of Minnesota. 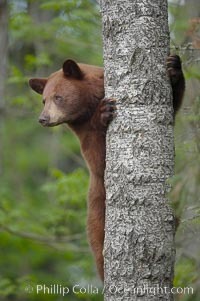 Black bear in a tree. 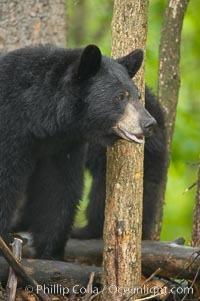 Black bears are expert tree climbers and will ascend trees if they sense danger or the approach of larger bears, to seek a place to rest, or to get a view of their surroundings. Photograph of Minnesota. 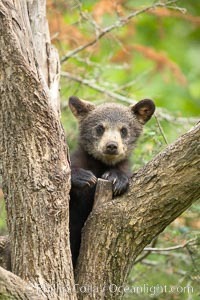 Black bear cub in a tree. Mother bears will often send their cubs up into the safety of a tree if larger bears (who might seek to injure the cubs) are nearby. 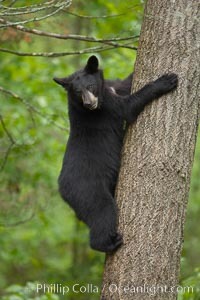 Black bears have sharp claws and, in spite of their size, are expert tree climbers. Minnesota Photos. Black bear in a tree. 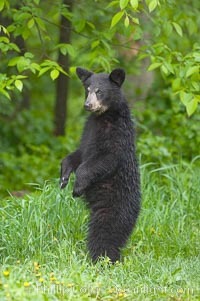 Black bears are expert tree climbers and will ascend trees if they sense danger or the approach of larger bears, to seek a place to rest, or to get a view of their surroundings. Minnesota Image. Black bear walking in a grassy meadow. 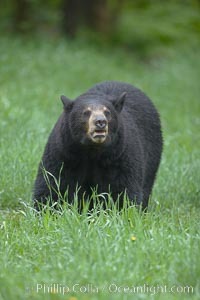 Black bears can live 25 years or more, and range in color from deepest black to chocolate and cinnamon brown. Adult males typically weigh up to 600 pounds. Adult females weight up to 400 pounds and reach sexual maturity at 3 or 4 years of age. Adults stand about 3' tall at the shoulder. Professional stock photos of Minnesota. Black bear walking in a grassy meadow. 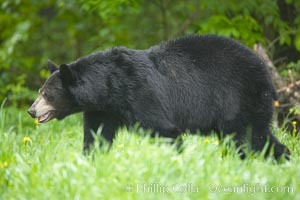 Black bears can live 25 years or more, and range in color from deepest black to chocolate and cinnamon brown. Adult males typically weigh up to 600 pounds. Adult females weight up to 400 pounds and reach sexual maturity at 3 or 4 years of age. Adults stand about 3' tall at the shoulder. Pictures of Minnesota. 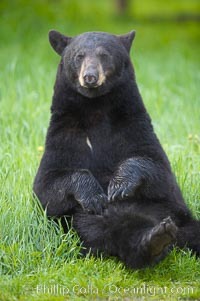 Black bear portrait. 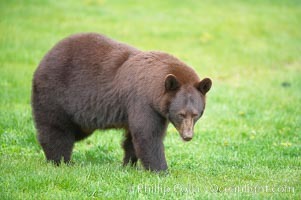 American black bears range in color from deepest black to chocolate and cinnamon brown. They prefer forested and meadow environments. This bear still has its thick, full winter coat, which will be shed soon with the approach of summer. Minnesota Photo. Black bear on granite rock. This bear still has its thick, full winter coat, which will be shed soon with the approach of summer. Minnesota Picture. Black bear walking in a forest. 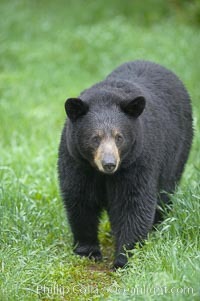 Black bears can live 25 years or more, and range in color from deepest black to chocolate and cinnamon brown. Adult males typically weigh up to 600 pounds. Adult females weight up to 400 pounds and reach sexual maturity at 3 or 4 years of age. Adults stand about 3' tall at the shoulder. Stock Photography of Minnesota. 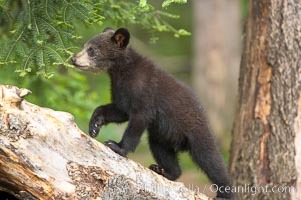 Black bear cub. 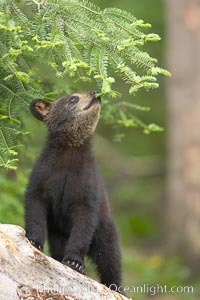 Black bear cubs are typically born in January or February, weighing less than one pound at birth. Cubs are weaned between July and September and remain with their mother until the next winter. Photograph of Minnesota. Black bear in a tree. 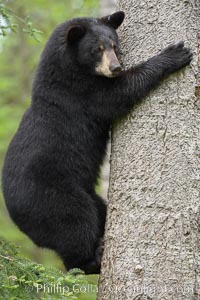 Black bears are expert tree climbers and will ascend trees if they sense danger or the approach of larger bears, to seek a place to rest, or to get a view of their surroundings. Minnesota Photos. Black bear portrait sitting in long grass. This bear still has its thick, full winter coat, which will be shed soon with the approach of summer. 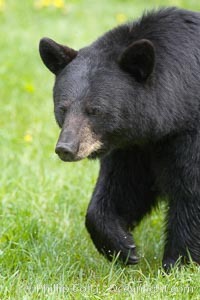 Black bears are omnivores and will find several foods to their liking in meadows, including grasses, herbs, fruits, and insects. Minnesota Image. Black bear portrait sitting in long grass. This bear still has its thick, full winter coat, which will be shed soon with the approach of summer. 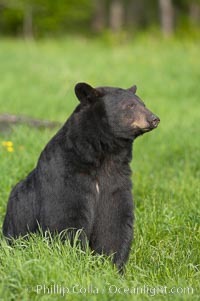 Black bears are omnivores and will find several foods to their liking in meadows, including grasses, herbs, fruits, and insects. Professional stock photos of Minnesota. 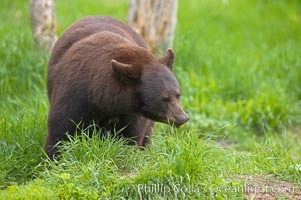 American black bear in grassy meadow. Minnesota Photo. Black bear in a tree. 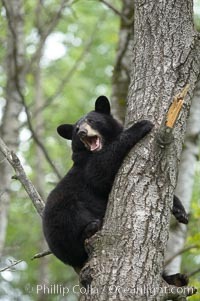 Black bears are expert tree climbers and will ascend trees if they sense danger or the approach of larger bears, to seek a place to rest, or to get a view of their surroundings. Minnesota Picture. Black bear walking in a grassy meadow. 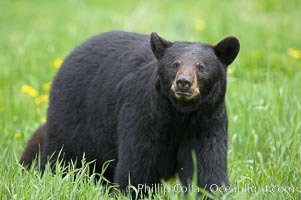 Black bears can live 25 years or more, and range in color from deepest black to chocolate and cinnamon brown. Adult males typically weigh up to 600 pounds. Adult females weight up to 400 pounds and reach sexual maturity at 3 or 4 years of age. Adults stand about 3' tall at the shoulder. Minnesota Photos. Black bear in profile. This bear still has its thick, full winter coat, which will be shed soon with the approach of summer. Minnesota Image. 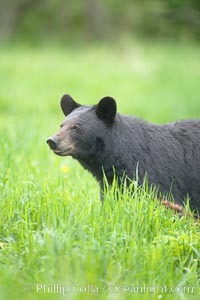 American black bear in grassy meadow. Professional stock photos of Minnesota. Black bear portrait sitting in long grass. This bear still has its thick, full winter coat, which will be shed soon with the approach of summer. 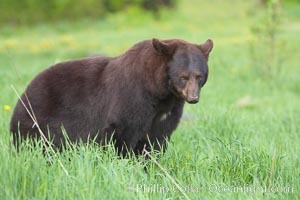 Black bears are omnivores and will find several foods to their liking in meadows, including grasses, herbs, fruits, and insects. Pictures of Minnesota. Black bear in a tree. 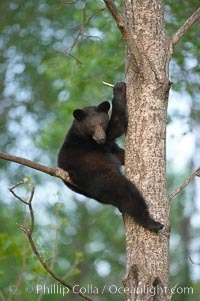 Black bears are expert tree climbers and will ascend trees if they sense danger or the approach of larger bears, to seek a place to rest, or to get a view of their surroundings. Minnesota Photo. 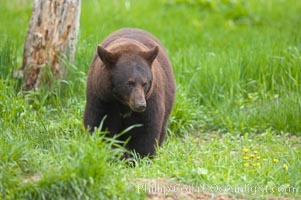 American black bear standing in meadow. Minnesota Picture. 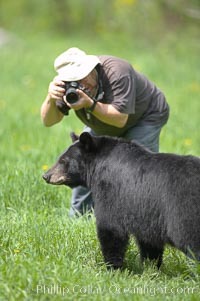 Photographer crouches down to photograph a black bear walking by. Photograph of Minnesota. 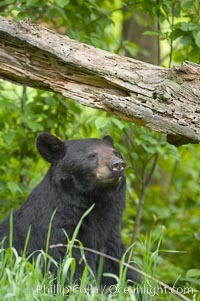 Black bear portrait. 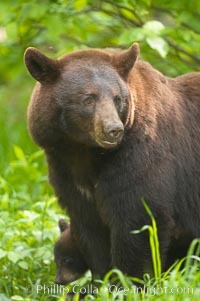 American black bears range in color from deepest black to chocolate and cinnamon brown. They prefer forested and meadow environments. This bear still has its thick, full winter coat, which will be shed soon with the approach of summer. Minnesota Photos. 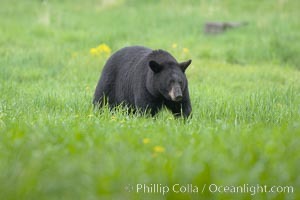 Black bear walking in a grassy meadow. 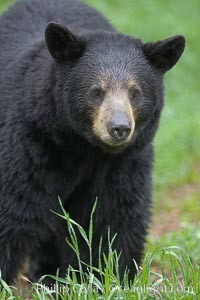 Black bears can live 25 years or more, and range in color from deepest black to chocolate and cinnamon brown. Adult males typically weigh up to 600 pounds. Adult females weight up to 400 pounds and reach sexual maturity at 3 or 4 years of age. Adults stand about 3' tall at the shoulder. Minnesota Image.